Family owned and operated by the Hunse Family since 1955, this land has been used for agriculture. 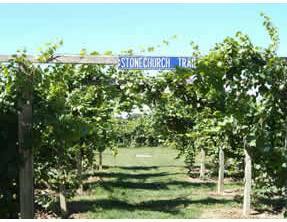 This winery is situated in the quite country area of Niagara on the Lake, Ontario and is surrounded by vineyards. In 1989 the Hunse Farm became the Stonechurch Vineyard, as the 170 acre farmland used for a variety of tree fruits were replaced with grape vines. Over the years the winery has changed by expanding the winery itself and adding more land for the vineyards. Recent upgrades including new harvesting equipment and wine-making equipment have helped improve the quality of wines produced. Tours of the winery are available. A self-guided tour of the vineyard is open daily, free of charge. Private tours and tastings are available by request, only offered from May to October.